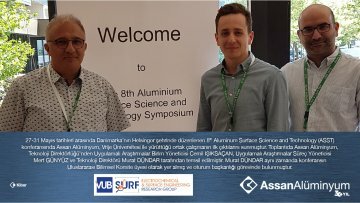 Aluminum Surface Science and Technology (ASST) conference, the most prestigious one in its field, was held in Helsingor, Denmark this year between May 27-31. Assan Alüminyum participated in this conference with a paper that involves preliminary results of a joint study that has been conducted with Vrije University, Brussels. Assan Alüminyum was represented by Cemil IŞIKSAÇAN, Unit manager of Applied Research Department, Mert Günyüz, Process Manager of Applied Research Department and Murat Dündar, Technology Director. Murat DÜNDAR also served among the International Scientific Committee Members of the conference and chaired a conference session.